Carlton Ware produced a good number of Posy Holders, often in a pattern which had no other shape in that design with the possible exception of a Candle Holder. Where other pieces have been made in a range, then often the Posy Holder looks very different. Carlton Ware produced this Water Lily range around 1937. This one is a yellow Posy Holder - shape number 1718. 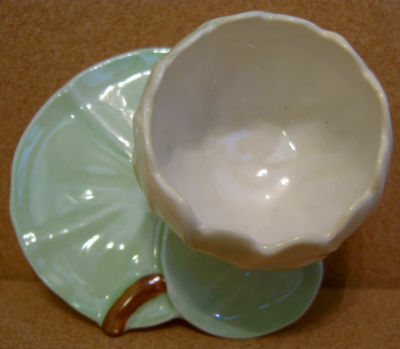 The flower part of the Holder is a pale creamy yellow which sits on the floating leaf in green with a brown stem. The Holder measures 2 inches (5 cms) in height and has a maximum width of about 4 inches (10 cms). It is in excellent condition with no evidence of crazing. There are no chips/nibbles etc.